Beautiful house in an amazing location with direct caldera views from many of the bedrooms and terrace. The property features a private pool with a large terrace, sun loungers and covered seating area. With a total of 400 sqm meters of living accommodation including 7 bedrooms, open plan lounge/dining area plus a well-fitted kitchen with all modern appliances. This house is the perfect location for a family holiday or a group of friends traveling together, extra options include the high of private chef and bar staff at extra cost. 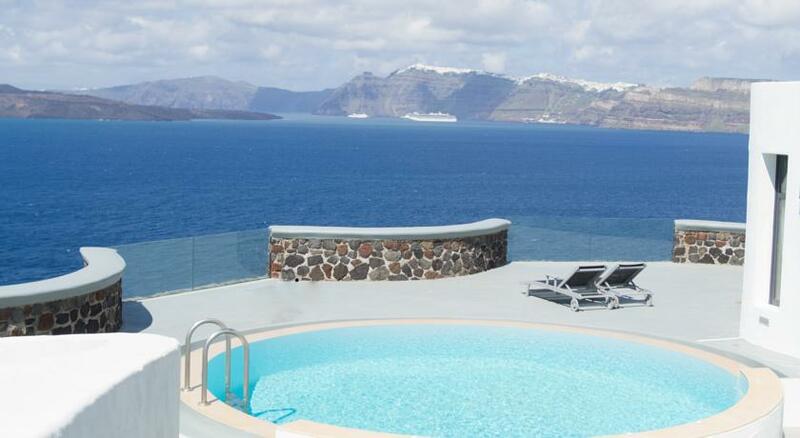 The luxury suites and villas all feature a private pool and wonderful views of the caldera, all are furnished in simplistic luxury with every comfort for its guests. Ambassador Villas and suites is a luxury hotel which gives its guests the feeling of staying in a private accommodation but with full luxury hotel facilities including beautiful freshwater infinity pool for the use of all guests, high-quality dining options, Wellness & spa center and much much more.